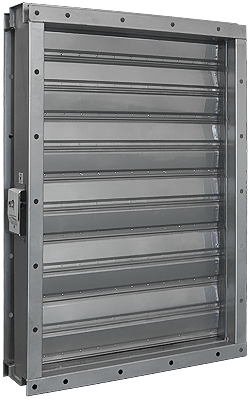 We offer stainless steel, ABS approved fire dampers. Approved for fitting to class A-60 divisions bulkheads and decks. • Fire Test Procedures Code, Annex 1, Part 3, for Class A60 bulkheads and decks. • DNV Type Approval Certificate No. F-18845. • USCG Approved (product category 164.139). • Germanischer Lloyds Approved to IMO Res. A.754. (18) and IMO Res. MSC61(67), Annex 1 Part 3. • American Bureau of Shipping Approved to: 2005 Steel Vessel Rules 1-1-4/7.7. • Corrosion Tested to BSEN 60068-2-52, severity 2 conditions. • Vibration Tested to BS EN 60068-2-6 (5Hz to 350Hz @ 2g). Click here to download the Pressure Drop vs. Velocity info!